If today is an average working day in Canada, then three people will die on the job. I found that startling statistic on the Threads of Life website. It’s a bit of a different take on the fact that nearly a thousand Canadians die on the job – or as the result of work-related injuries and illnesses – every year. And these people, of course, leave behind families, friends and co-workers devastated by this tragic loss. Threads of Life is a Canadian charity committed to helping families heal through a community of support – and promote the elimination of life-altering workplace injuries, illnesses and deaths. Threads of Life was the first organization in the world to offer a peer support program to family members who are living in the aftermath of a workplace tragedy. This is why I got involved with Threads of Life as a volunteer – but not as a peer support to a family member who is dealing with a workplace tragedy. Although I have walked a similar path myself – in the years following my husband, John’s, death in 2000, which was the result of a preventable fall at an unsafe workplace – I have chosen not to volunteer in the capacity of helping another human being walk a similar path. Because to be perfectly frank, that particular volunteer role requires more than I have to give at this point in my life…more time, effort, energy, patience and compassion. So my hat goes off to all those Threads of Life peer support volunteers who have not only lost a loved one to a workplace tragedy – or are dealing with a work-related life altering illness or disease, or one of their loved ones are – but are also actively helping another person go through their own healing journey. But I do have an idea of just how incredibly important this support role is because my friend, Kristin (and others) played a similar role in my life after John died. And the older I get, the more I appreciate just how much time, effort, energy, patience and compassion that kind of unconditional love – and active listening – requires. So what I can do for Threads of Life is contribute my time, energy, experience and passion for workplace safety in a different way: I can help raise awareness with people that the organization exists and what services and programs they offer that can support workers coping with a workplace fatality, injury or illness – and let people know how necessary that support is. 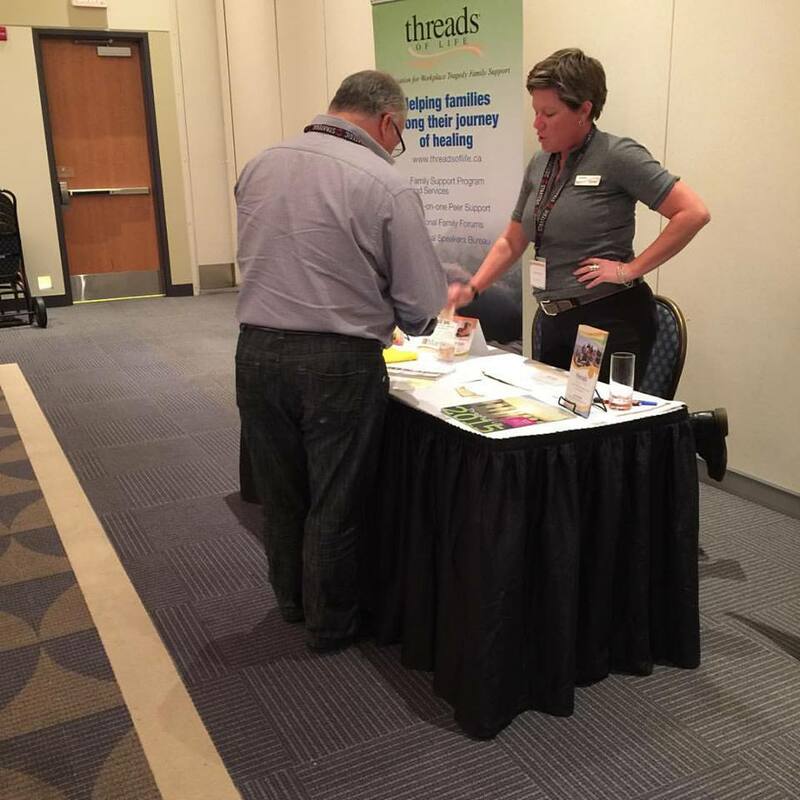 So this past weekend, I did just that and volunteered at the Threads of Life table at the Vancouver Island Safety Conference in Nanaimo, BC. Because not everybody has a Kristin in their life…someone who can shut up and just listen. Someone who won’t judge. Someone who doesn’t interrupt. Someone who truly hears what you are saying versus simply waiting for you to stop talking so that they can speak. As perhaps you may have noticed, listening skills of this calibre are not in everyone’s repertoire – mine included. Kristin and I have been friends a long time. We met on the soccer field in grade 8 when we played community soccer together. 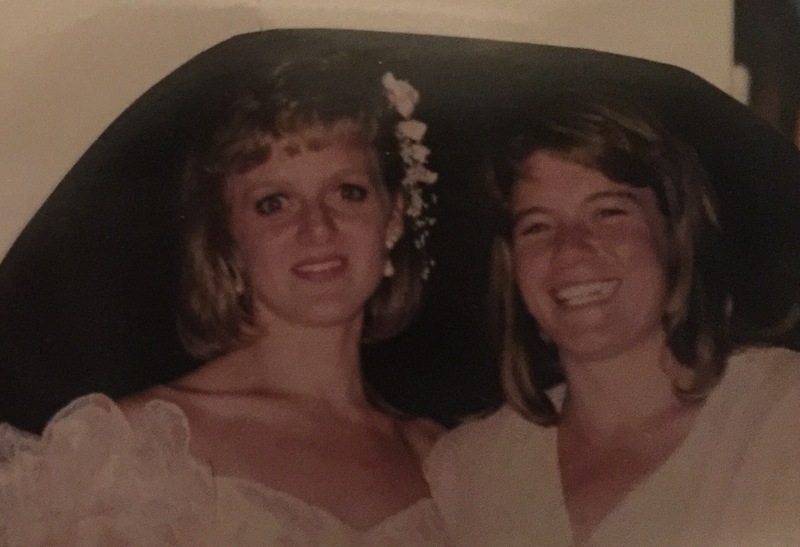 Even though we didn’t go to the same schools (she was in the Catholic school system and I was in the public system), we remained friends. And then boy, did we have fun partying in University…and for years after, too! The day after John died, Kristin ran out and bought me a hat and shoes to wear to his funeral…and from that day on, she was there for me. A listening ear, a shoulder to cry on and, perhaps most importantly, someone to tell the sordid details about what I was really thinking and feeling because I was too embarrassed to tell anyone else, as I didn’t want to be labeled as crazy. Fast forward a decade and a half and it is amazing to see what a beautiful tapestry some of those threads of my life are weaving themselves into. Kristin is still a dear friend. She is still on the Board of Directors of the John Petropoulos Memorial Fund (JPMF). And her daughter, Harleigh, is now a JPMF volunteer. 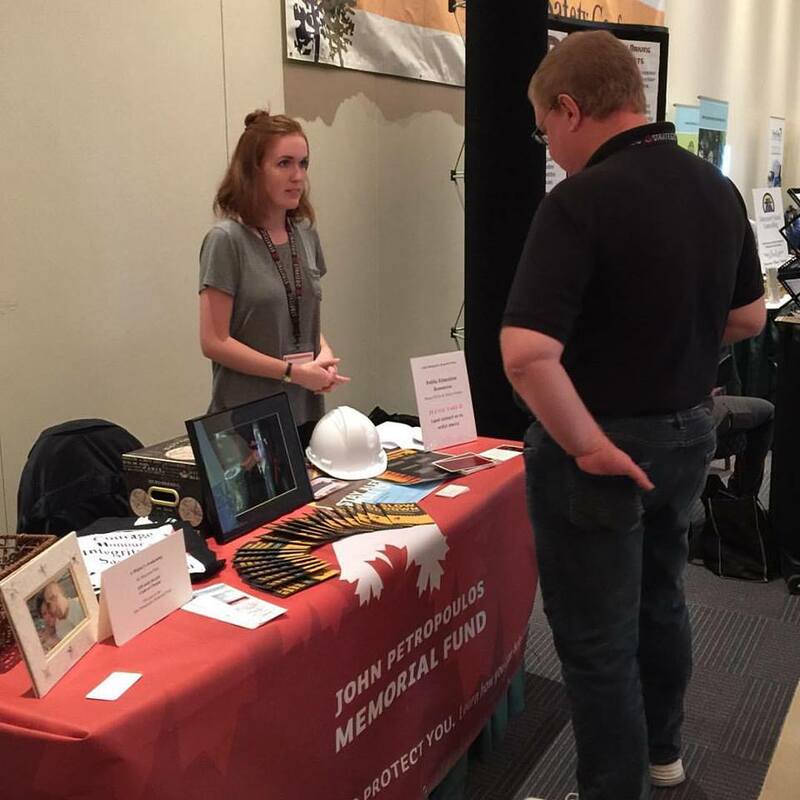 In fact, Harleigh worked at the JPMF booth, right beside the Threads of Life booth at the Vancouver Island Workplace Safety Tradeshow. We had a great time! We spoke to hundreds of conference delegates. Harleigh educated people about what the JPMF is doing to teach the public about why and how to make their workplace and the roads safer for everyone, including emergency responders. I spoke to people about the programs and services offered by Threads of Life. 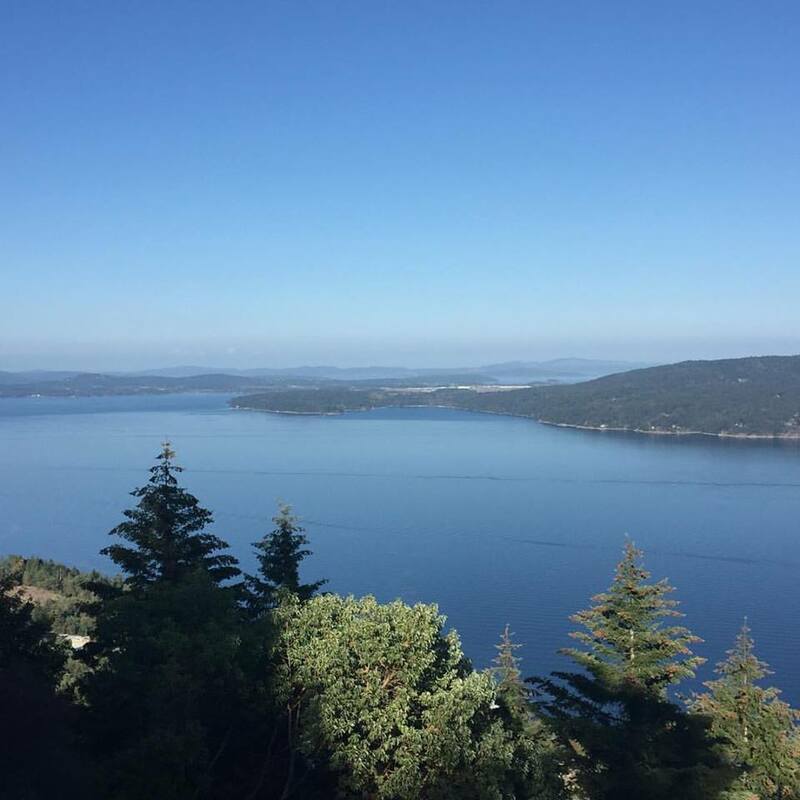 Although we both had an awful lot of meaningful interactions that day, I would like to share with you one person’s comment – as it really sheds light on the importance of Threads of Life. The guy was in his late twenties and I told him briefly what Threads of Life does. And I must admit I kind of expected him to nod his head and wander off. But he didn’t. My personal experience was one of coming to terms with the death of a spouse, as the result of workplace injury. But if, for example, the chair that John hit on his way down was an inch to the left, I could’ve easily been left with a seriously brain-injured husband instead. Every day, there are hundreds of Canadians getting injured on the job. The emotional, psychological, financial, etc impact of life-altering injuries and diseases on both the worker and his or her family is not only immense, the repercussions often go on and on and on. It was an honour to be able to spend a Saturday helping spread the word about Threads of Life – alongside Harleigh, raising awareness about the JPMF. 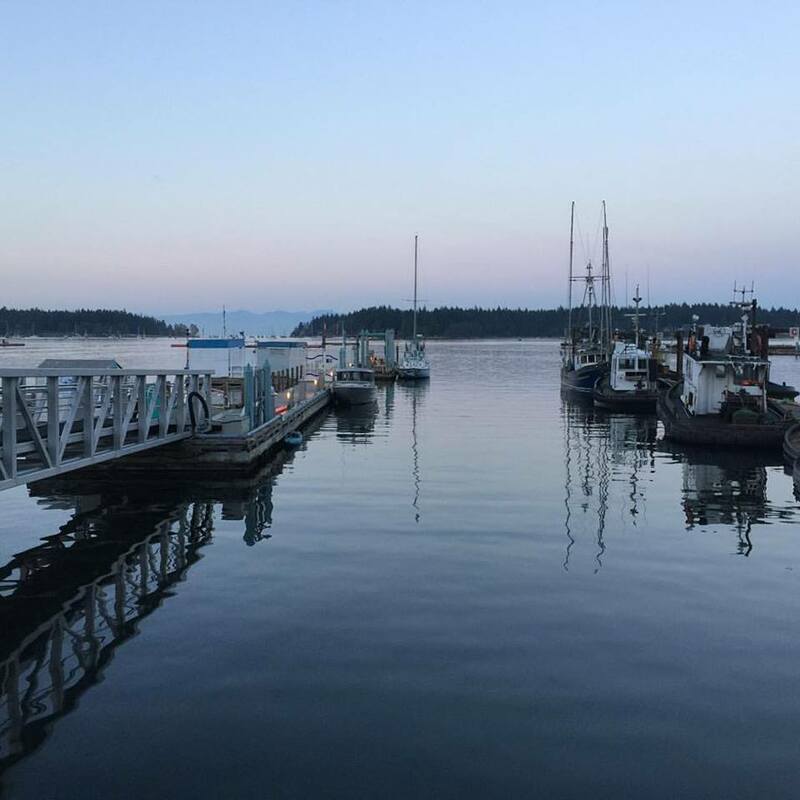 I think one of the great things about getting older is that hindsight gives us the chance to look back at our experiences thus far and perhaps see some common themes or patterns emerging in the tapestry of our lives. I find it fascinating how one thread that began decades ago still continues on. That we are blessed to often have many of these threads – such as good friends and family – is pretty incredible. If someone had told me, back in Grade 8, that Kristin and I would still be close friends more than thirty years later AND that her daughter would be volunteering for the Fund in my husband’s memory, I’m not sure I would have believed them. 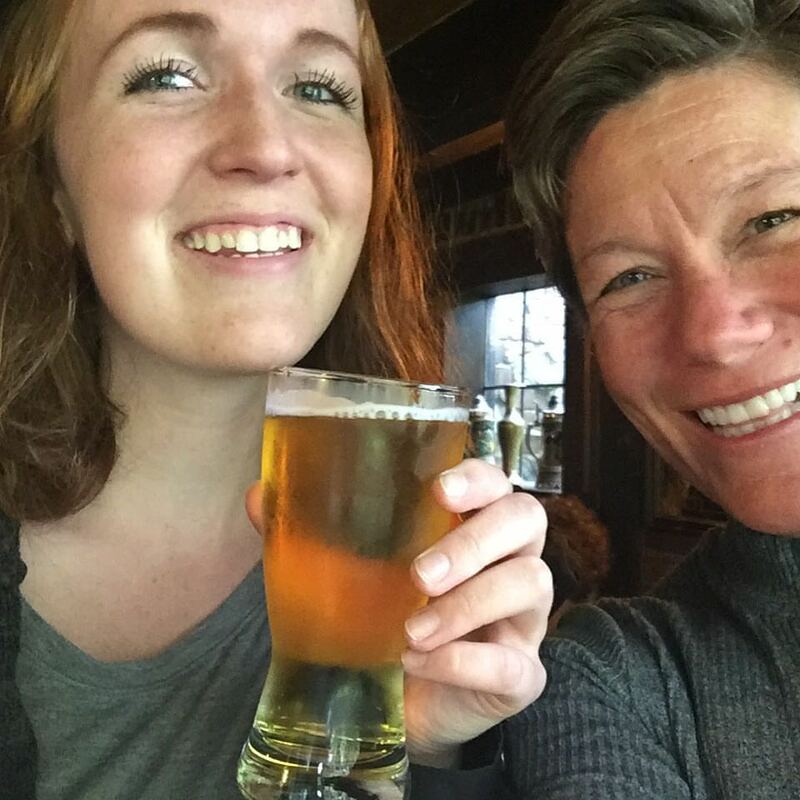 But then again, nor would Kristin have been able to foresee that her Dad would succumb to mesothelioma – a horrific cancer, caused by repeated exposure to workplaces that contained asbestos. Asbestos exposure is the single largest on-the-job killer in Canada. Since 1996, almost 5,000 approved death claims stem from asbestos exposure, making it by far the top source of workplace death in Canada (Association of Workers’ Compensation Boards of Canada). 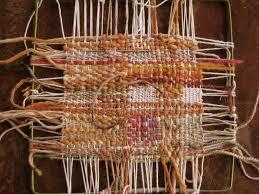 Oh…and give thanks for all the threads – people, pets, gifts, skills, opportunities, education, peace, health, finances and so on – we have been given to weave with. Merci and have a safe week! Thank you Maryanne for volunteering for Threads of Life and bringing awareness of this incredible organization that our family joined 13 years ago after the workplace death of our son John. Threads of Life helped save my life! We continue to spread the word of workplace safety through presentations in workplaces and especially in schools. We don’t want anymore members in this club!! Hi Marjorie! Yes, you are a very involved with Threads of Life…in fact, I think that is how we first met! It IS an incredible organization – but you are right, we don’t want any more members to join THAT club. That is outstanding that you are still continuing to spread the word about workplace safety through presentations in workplaces and schools…right on! Take care and Happy Thanksgiving!